For those moments when you need a bit more carrying capacity, look to a larger bag to hang on your belt! This Large Round Pouch is a coin purse for the wealthy and a handsome accent for any adventurer, noble, or serf to use when carrying their things! The pouch is made entirely from high quality leather with a supple bag design that allows it to expand or collapse, depending on how full it is. This ensures that the bag can carry a lot without taking up too much space! The lace closures tie off and are secured via a leather plate on the front for security when worn too. 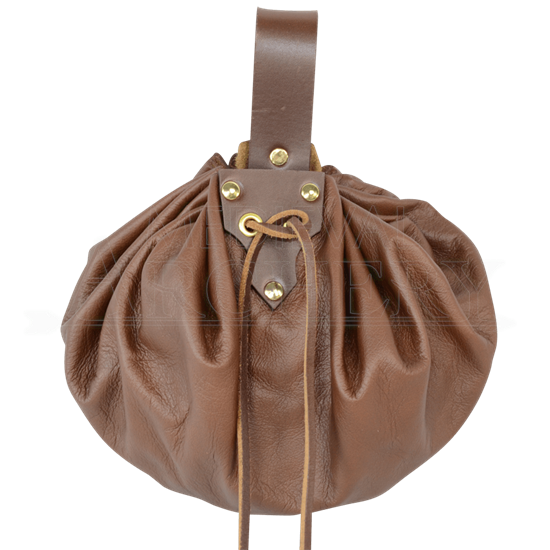 Slip this Large Round Bag onto your belt and you will be ready for the fair, no matter what you wear! This is a sizeable bag. I was able to fit a wallet, cellphone, massive keyring, and other junk in here, and still managed to close it with no trouble. The draw strings are quite long, so you're going to have to do a lot of tying unless you're okay with them hanging down about seven or eight inches. It (I bought the black one) looks exactly as advertised, the leather is solid; overall a great purchase. Perfect sized pouch for phone, wallet, keys and even a pair of glasses. Easy to open and close and looks awesome too.